Rare And 'Horrific': Frilled Shark Startles Fishermen In Australia : The Two-Way The frilled shark's roots are traced to 80 million years ago. Its prehistoric origins are obvious in its primitive body; nearly all of the rare animal's closest relatives are long extinct. A frilled shark swims in a tank after being found by a fisherman off Japan's coast in 2007. One of the rare creatures was recently caught in Australia, shocking fishermen. Normally, we wouldn't call something a living fossil. 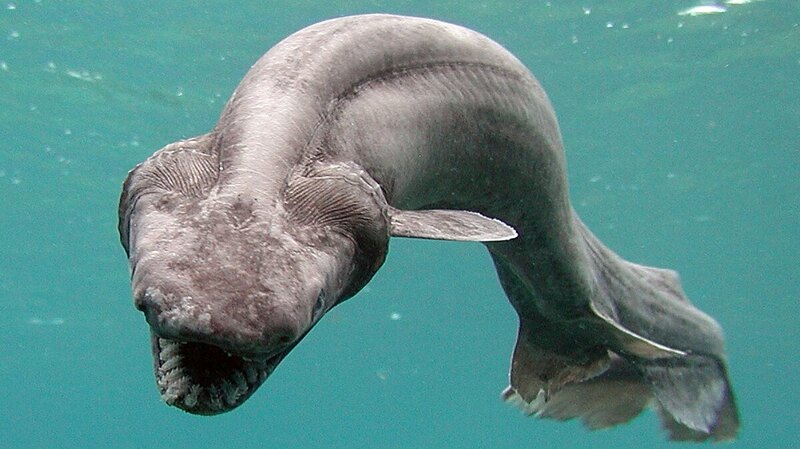 But the name seems tailor-made for the frilled shark, whose roots are traced to 80 million years ago. Its prehistoric origins are obvious in its primitive body; nearly all of the rare animal's closest relatives are long extinct. In the most recent of those 80 million years, the frilled shark has been scaring the bejeezus out of humans who pull it out of the water to find an animal with rows of needle-like teeth in a gaping mouth at the front of its head. That's what happened recently off Australia's coast, where a fishing trawler's net snagged a frilled shark. "It was like a large eel, probably 1.5 meters [about 5 feet] long, and the body was quite different to any other shark I'd ever seen," fisherman David Guillot tells 3AW radio. "The head on it was like something out of a horror movie. It was quite horrific looking." The catch was announced by the South East Trawl Fishing Industry Association, which said it couldn't find anyone who had ever caught one before. "It has 300 teeth over 25 rows, so once you're in that mouth, you're not coming out," SETFIA's Simon Boag tells the ABC. "Good for dentists, but it is a freaky thing. I don't think you would want to show it to little children before they went to bed." Relatively little is known about the frilled shark, whose name refers to its six pairs of gills. The animals are believed to live at depths of between several hundred and several thousand feet. They've rarely been seen in their natural environment, and a rare living specimen, caught in Japan in 2007, died soon after it was put in a large seawater pool.